If there’s one thing we all thing about it’s our retirement and what better to plan for your future than with an awesome app that will help you fund your twilight years. Here are some best apps and calculators for retirement planning. Best part of life is retirement. Eligible people will get paid even after retirement and one should be very careful in calculating when planning for a retirement. Why don’t you make use of technology and try these apps and calculators for retirement planning? This free online app was created to help anyone who is working and currently planning to retire by providing them with some basic information about how much money they’ll need to put away by asking its users a series of questions. The questions you have to answer range from what your current household status is, your age, what your salary is, your lifestyle and what your retirement savings account is currently sitting at. It then takes all of this information and works out if you’re on track or behind with your plans for retirement. If you’re behind it will suggest ways to increase your savings account, ways to change your lifestyle to save money and how to make more money out of your job i.e. working longer hours or part-time when you’re retired. Another one worth checking out the Retireplan app is available only on iOS and costs £4.99 but for that price it will give you answers to questions like when you can retire, what you need to put away each month or year into your savings account whilst still living comfortably and options to increase your savings. It uses the same questions as the AARP Calculator but it can also be set up to include your spouse, paying for children’s college tuition and current market inflation as well as estimations on how tax will affect your income. 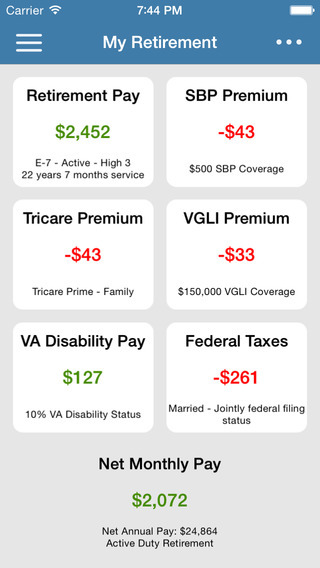 If you’re a serviceman and you’re retiring soon then this free iOS app is perfect. It covers all branches of the military and the app works out your retirement plan by factoring in your age, how long you’ve been in the service, rank, Survivor Benefits, current taxes and the date of your retirement. Another way you could finance your future would be to try investing, in today’s economy you can invest in pretty much anything from minerals, company stocks and even gold if you want. If you do plan on investing then gold is always a great choice as it’s stable and is always increasing in value, if you want to sink some of your cash into gold then you might want to check out this site goldiranavigator.com, it help you find the best option to invest. If you’re planning on investing you could try using this next app. This fantastic free app that lets you see how long your retirement investment portfolio would last over a number of years and which options would be the best to invest in. How it works is you enter the size of your investment portfolio and it uses a Monte Carlo simulation that runs off historical stock market information to calculate the size of the return you would get from each area and how long this cash would last for should you choose to invest it. There’s nothing more important than planning for your future so to simplify this often stressful task you could always try using one of these top apps to make sorting out your retirement options easier. How To Do Online Payments And Transactions Carefully!